News | DoubleDragon Properties Corp.
“Edgar "Injap" Sia II's DoubleDragon Properties Corp. completed the first of its signature project—branded community malls—only less than two years ago but it already outperforms other property developers in the Philippines as well as Asia. Since its IPO in April 2014, DoubleDragon stocks have risen by 2,500 percent as of end-January this year, beating 460 other Asian property development companies valued at least $500 million, said Bloomberg. 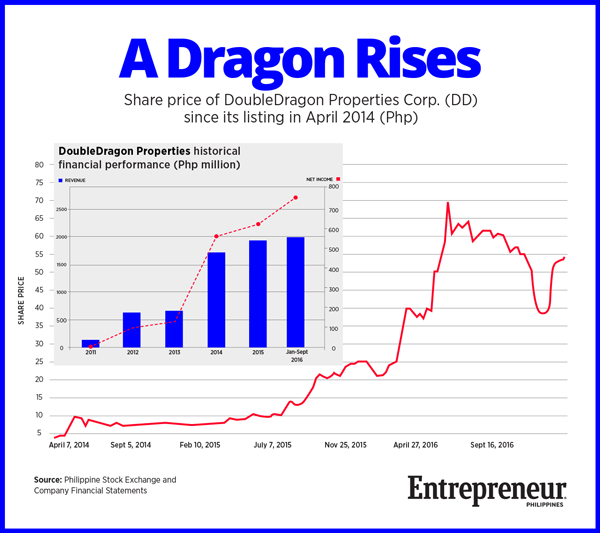 The surge boosted DoubleDragon's market value to Php115.1 billion, helping it become one of the country's five biggest property developers by market capitalization. It is now more valuable than older property developers with bigger real estate inventories such as Manuel Villar's Vista Land & Lifescapes as well as the Gotianun's family's Filinvest Land. "Since DoubleDragon's 2014 initial public offering, the only developers worldwide to beat its gain have been a Venezuelan real estate investment trust and a US-listed Chinese provider of real estate services," Bloomberg wrote. DoubleDragon began as Sia's family-owned property company called Injap Land, formed in 2009. It was renamed in 2012 after Sia struck up a 50-50 partnership with Jollibee Foods founder Tony Tan Caktiong to go into property development. That came after Sia sold 70 percent of his Mang Inasal fast-food chicken barbecue chain to Jollibee. Two years later, the partners listed DoubleDragon. The company is rapidly expanding its footprint nationwide through its branded malls called CityMall, a chain of community shopping centers, no bigger than 10,000 square meters each. Sia is planning to build 100 such malls by 2020 in cities with populations of 100,000 to 150,000. He is betting to catch the big shift from traditional to modern retailing in these urban centers that bigger shopping mall operators such as SM Prime Holdings and Robinsons Land Corp. find unattractive. "These smaller provincial cities, starting in the next two to three years, will be the most important areas for modern retail. Once you spot a gap that big players missed or nobody has paid attention to in a transition, you will own that space for many decades," Sia told Bloomberg. The DoubleDragon unit that builds and operates the community malls is partly owned by Henry Sy’s SM Investments Corp., the developer of the country's largest malls. DoubleDragon reported a 15 percent rise in gross revenue and seven percent gain in net income in the first nine months of 2016 from the same period the year before. © Copyright DoubleDragon Properties Corporation. 2019, All Rights Reserved.